And Tile on the Same Day! Here’s the problem: waterproofing showers is confusing. There are conflicting opinions online and in home stores. 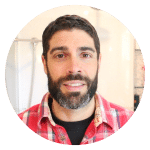 So what products make shower remodeling fast and easy and 100% waterproof? Today we’ll share why Hydro Ban Board is a great option. Anyone who’s worked with cement board knows it’s heavy. Each 3′ x 5′ x 1/2″ panel is way heavier than a comparable foam board product. However, there are many foam board options. And each one has different requirements. We’ve worked with KERDI-BOARD, Wedi, and now Laticrete’s Hydro Ban Board. Each panel is only a few pounds and can be cut with a utility knife. Plus the extruded polystyrene core is waterproof. Thus, if the fleece is cut the board is still waterproof. Stud walls need to be 16″ on-center for Hydro Ban Board – same with other foam backer boards and cement board. Screws should be 12″ on-center along the stud and no washers are needed for walls, as you’ll see. That said, Hydro Ban Board does need washers if used for ceilings. This method totally replaces the need for Hydro Ban over cement board and is much faster. People always ask how to waterproof the gap between the tub and backer boards. This is easy with Hydro Ban Board, use the sealant. Sealant can also be applied between boards and drywall. Watch our video to see how we waterproofed our latest tub shower in 2 hours! Tile can be set over Hydro Ban Board as soon as the sealant is tacky, in about 2-3 hours. Hydro Ban Boards are fantastic and the price point is super competitive – let me repeat that, SUPER COMPETITIVE. You guys make it look easy. My problem is since I don’t do this routinely, the measuring really slows me down. Don’t get down on yourself John, taking your time with the measuring is critical. And you’ll actually save time by not making mistakes. I love Hydro Ban board as well. 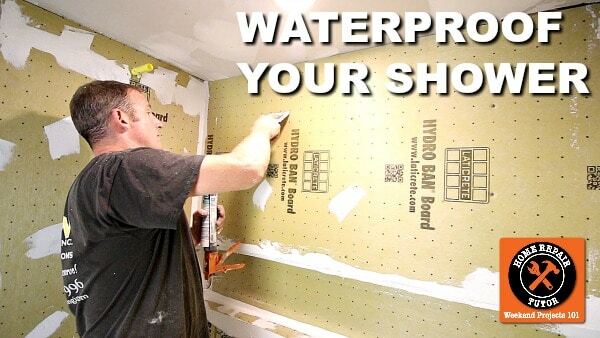 It’s super fast to install and creates a bulletproof and long lasting waterproof shower. Great tutorial! Thanks a ton Jeff and we couldn’t agree more. We’ll be using it more often and recommending it to folks who want a fast installation for a reasonable price. We still like the other products but no doubt, Laticrete has great stuff. Day late and 6 wonder boards later. Do I need to water proff the wonder board if so what to use? Sorry to hear that Jim. Yes, all cement boards should be waterproofed with something like RedGard, Ardex 8+9, or Hydro Ban. Those are solid products. Could you notch the board at the bottom is you don’t need the furring? You could totally do that Gary and we’ll show that in our next tub shower combo. The hydro ban board is not easy to find. Any suggestions on where I can find this in New Jersey – looking at mail order right now. Are the other boards you mention equally as good? We like Schluter’s Kerdi-Board and Wedi’s foam boards. Laticrete made an awesome product with the Hydro Ban Board and it’s reasonably prices. If you can’t find a dealer close to you check out Contractor’s Direct online. They’re also great to deal with. Thanks for all of your helpful videos! Since the board is waterproof as an alternative to putting furring strips to install the Hydro Ban board would it be possible to use a router or table saw to notch the edge of the board by the thickness of the flange so that it sits flush with the tub flange? Hey Jeff, just curious as to how much sealant/adhesive you guys had to use and also if there’s anything other than the sealant/adhesive needed or required to waterproof corners or joints such as hydroban sealing tape. Thanks! Love the site! Any thoughts on how this board will work with marble install? do you countersink the screws through the board, or just through the wood? The shower surround requires Hydro Ban Adhesive and Sealant, this will also maintain the Laticrete warranty.